On a nice day, there is nothing like taking the dog and walking around a local park or hiking trails. I was recently at a local spot that my husband and I like to visit when I noticed something: how dirty some of the spaces were. Understandably summer is a busy time and it’s not uncommon for dirt and mud to be tracked along traveled paths, but I did take note. That’s when I saw this job from our pressure washing company in Victoria and it made me realize the importance of making common areas beautiful again. Fossati Park is a beautiful spot in Victoria, Texas. With water, decks, benches and large grassy areas, it’s a great park to bring the family and enjoy some time outdoors. It, however, had seen better days this year. The park was still a great place to go, it’s just that the wood was starting to fade and splinter. Water was being absorbed by the wood, which can lead to rot and other issues. Renew Crew to the rescue! Using our 3-step cleaning and protecting process, Charlie Boswell and the Renew Crew of Victoria team gave the decks throughout the park a facelift this year. The first step in our process is to clean the word using our environmentally friendly wood cleaning foam. Unlike other pressure washing companies that mostly used bleach and other harsh chemicals, all of Renew Crew’s products are eco-friendly. It was very important that eco-friendly cleaning products were used on this project because of the surroundings. The city wouldn’t want anything used that could harm the trees or water that go through the property. And just because it isn’t a harsh chemical doesn’t mean it doesn’t work incredibly well. 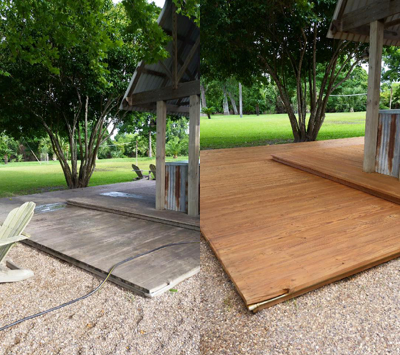 Renew Crew’s formula works wonders on wood, loosening embedded dirt and grime. After the foam has time to work its magic, we rinse the surface with a light power pressure wash that’s strong enough to get rid of all the grime but will not gouge the wood in any way. The last step and most important is protecting the surface. A semi-transparent wood protectant was applied to the surface, blocking water, dirt, and UV rays from affecting the wood. 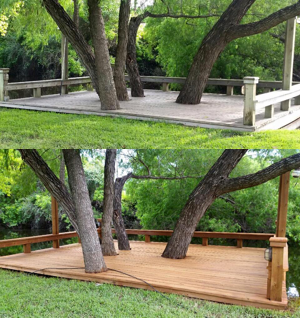 With just a little TLC, Renew Crew was able to enhance this space for more families to enjoy!